Here’s some brand new stuff that came out the week of December 23 that I think is worth a look-see for someone with little to no history with comics. That means you should be able to pick any of these up cold without having read anything else. So take a look and see if something doesn’t grab your fancy. If so, follow the publisher links or Amazon.com links to buy yourself a copy. Or, head to your local friendly comic book shop. Imagine Plato as a wrestling superstar of ancient Greece, Nietzsche as the original ubermensch, and Bohidharma as the grand master of kung fu. These are not just great thinkers they also make great comics. Action Philosophers details the lives and thoughts of history’s A-list brain trust in hip and humorous comic book fashion. All nine issues of the award-winning, best-selling comic book series have been collected into a single volume, making this a comprehensive cartoon history of ideas from pre-Socratics to Jacques Derrida, including four new stories. You’ll never have more fun getting the real scoop on the big ideas that have made the world the mess we live in today! Tom Morris (Author of Philosophy for Dummies, If Aristotle Ran General Motors, and If Harry Potter Ran General Electric). I’ve got an issue of this that looks at Ayn Rand and it’s excellent. Fun and informative. This same team is working on a comic about the history of comics, which astoundingly has never been done before to my knowledge, called Comic Book Comics. Here’s an 8-page preview of Action Philosophers looking at Carl Jung. For centuries, cartoonists have used their pens to fight a war against war, translating images of violent conflict into symbols of protest. Noted comics historian Craig Yoe brings the greatest of these artists together in one place, presenting the ultimate collection of anti-war cartoons ever assembled. Together, these cartoons provide a powerful testament to the old adage, “The pen is mightier than the sword,” and remind us that so often in the 20th century, it was the editorial cartoonist who could say the things his fellow newspapermen and women only dreamed of, enlightening and rallying a nation against unjust aggression. Readers of The Great Anti-War Cartoons will find stunning artwork in a variety of media and forms (pen-and-ink, wash, watercolor, woodcut — single images and sequential comic strips) from the hands of Francisco Goya to Art Young, from Robert Minor to Ron Cobb, and from Honoré Daumier to Robert Crumb, as well as page after page of provocative images from such titans as James Montgomery Flagg, C.D. Batchelor, Edmund Sullivan, Boardman Robinson, William Gropper, Maurice Becker, George Grosz, Gerald Scarfe, Bill Mauldin, Art Spiegelman and many more. The book also includes an Introduction by 2006 Nobel Peace Prize winner Dr. Muhammad Yunus and a Foreword by Library of Congress curator Sara W. Duke. This book is neither ideological nor parochial: The cartoons range across the political spectrum from staunch conservative flag-wavers to radicals and hippies, and span two centuries and the entire globe (Australia, Russia, Poland, France…). But their message remains timeless and universal. What better way to celebrate the season of peace than this collection of anti-war editorial comics? Well, OK, maybe there are better ways, like donating to charities or volunteering with anti-war movements, but this is a good way, too. Here’s a 10-page preview in PDF. There are comics dating back to the 1800s. Pretty fascinating. I particularly like the one from 1915 by Luther Bradley and the one from 1920 by Jay “Ding” Darling. At last – The Original Johnson, Trevor Von Eeden’s personal and heartfelt graphic novel biography of Jack Johnson, the first African-American heavyweight champion of the world, international celebrity, and the most controversial American of his time. This is the artistic achievement of Trevor’s career (Batman, Black Canary, Black Lightning, Green Arrow), more than four years in the making and worth every moment. Welcome to New York. Here, burning figures roam the streets, men in brightly colored costumes scale the glass and concrete walls, and creatures from space threaten to devour our world. This is the Marvel Universe, where the ordinary and fantastic interact daily. This is the world of Marvels. 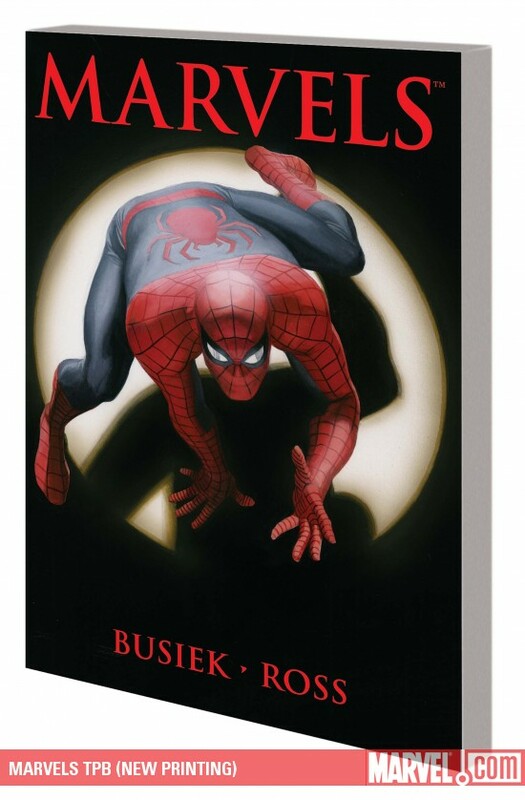 Originally released in 1994 to much acclaim and enthusiasm, this new printing provides a great introduction to the world of superheroes and the superhero world of the Marvel Universe in particular. Looking back at it now, the painted art feels like it’s a little much (do superheroes really need to be that realistic and life like?) but with superhero movies now a pretty normal occurrence, maybe it was never that big of a leap. Either way, the story is told from the point of view of a normal guy in Marvel’s New York struggling through life as flashy dressed people with extraordinary abilities start running around the city and inevitably break things. There’s a small preview at the Amazon link above. Buried deep in the archives is one bloody incident, in 1956, that left 111 Palestinians dead, shot by Israeli soldiers. Seemingly a footnote to a long history of killing, that day in Rafah—cold-blooded massacre or dreadful mistake—reveals the competing truths that have come to define an intractable war. In a quest to get to the heart of what happened, Joe Sacco immerses himself in daily life of Rafah and the neighboring town of Khan Younis, uncovering Gaza past and present. Spanning fifty years, moving fluidly between one war and the next, alive with the voices of fugitives and schoolchildren, widows and sheikhs, Footnotes in Gaza captures the essence of a tragedy. As in Palestine and Safe Area Goražde, Sacco’s unique visual journalism has rendered a contested landscape in brilliant, meticulous detail. Footnotes in Gaza, his most ambitious work to date, transforms a critical conflict of our age into an intimate and immediate experience. I’m a big admirer of Joe Sacco and his work, and here it looks like he’s going one step further in developing comics journalism, where he targets one specific story to investigate. Here’s a great preview (PDF) that pulled me right in. I need to get this. Luke looks on at the pigeons in Central Park, while Dad is lost in “boring Daddy talk,” and before you know it—LUKE IS ON THE LOOSE! He’s free as a bird, on a hilarious solo flight through New York City. 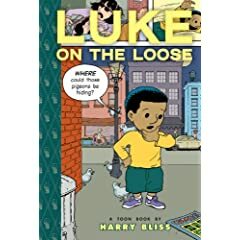 Harry Bliss, the renowned illustrator of many bestselling children’s books, finally goes on a solo flight on his own with a soaring story that will delight any young reader who has ever felt cooped up. This looks very cute. Recommended for kids age 4-8, but I won’t tell anyone if you’re older and get this because it looks very charming and fun. Here is a preview of the kid running through the city with his new pigeon friends causing mayhem. For the first time ever, the groundbreaking autobiographical comics of master cartoonist Eddie Campbell (FROM HELL) are collected in a single volume! 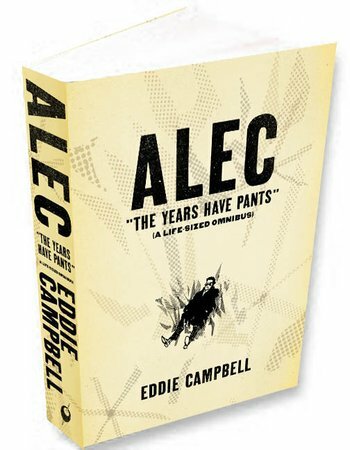 Brilliantly observed and profoundly expressed, the ALEC stories present a version of Eddie’s own life, filtered through the alter ego of “Alec MacGarry.” Over many years, we witness Alec’s (and Eddie’s) progression “from beer to wine” — wild nights at the pub, existential despair, the hunt for love, the quest for art, becoming a responsible breadwinner, feeling lost at his own movie premiere, and much more! Eddie’s outlandish fantasies and metafictional tricks convert life into art, while staying fully grounded in his own absurdity. At every point, the author’s uncanny eye for irony and wry self-awareness make even the smallest occasion into an opportunity for wit and wisdom. Quite simply, ALEC is a masterpiece of visual autobiography. ALEC: THE YEARS HAVE PANTS (A LIFE-SIZE OMNIBUS) collects the previous Alec books THE KING CANUTE CROWD, GRAFFITI KITCHEN, HOW TO BE AN ARTIST, LITTLE ITALY, THE DEAD MUSE, THE DANCE OF LIFEY DEATH, AFTER THE SNOOTER, as well as a generous helping of rare and never-before-seen material, including an all-new 35-page book, THE YEARS HAVE PANTS. I don’t know, that blurb kind of says it all. Here’s a 16-page preview.